17 Sep 2015 Washington D.C.
Marco Rubio’s attempt to rebut Donald Trump’s pro-English platform during Wednesday night’s GOP primary debate may haunt him for the rest of the campaign. Promoting the further fragmenting of the country, Rubio suggested the best way to spread liberty was to bring predominantly poor migrants into the country and then speak to them in their native language (even though one is technically supposed to learn English to become a voting citizen). As Rubio continues to struggle in the polls— despite effectively unlimited financial resources and near-universal support from donor class conservatives— it was essential that he deliver a stellar performance in tonight’s second GOP debate. Instead he has opened an uncomfortable line of inquiry by highlighting his penchant for campaigning in a foreign language. Rubio has a long track record of delivering one message to English audiences and another to Spanish audience, even though he is given a free pass from career conservatives for doing so. For instance, during the height of debate about the Gang of Eight immigration bill in an interview with Univision, Rubio told his Spanish audience that amnesty and legalization of illegal immigrants would precede border enforcement. Rubio repeated this same tactic earlier this year when he endorsed Obama’s executive amnesty for illegal immigrants in a Spanish media interview with Jorge Ramos. After Ted Cruz mentioned that he had worked side-by-side with Senator Jeff Sessions to oppose the Gang of Eight bill Rubio championed, Rubio had no answer. He offered no defense whatsoever for his co-authorship of the immigration expansion bill endorsed by La Raza, Barack Obama, and the Silicon Valley billionaires. Instead, Rubio talked about securing the border and outlined several enforcement measures he thought needed to be enacted in order to successfully achieve border security. However, Rubio did not mention—nor did any of the moderators ask him why— he voted against all three of those enforcement measures in his attempt to pass his and Obama’s immigration expansion bill. Rubio’s immigration bill would have imported 33 million more immigrants into the country within the span of a single decade. In his answer, Rubio went on to indicate that— due to his failure to drag that bill across the finish line— if given a second chance, he’d chop it up into a small pieces but implement the same mass immigration. “We cannot deal with [these] problems in one massive piece of legislation,” Rubio said. This was the same strategy pushed by Eric Cantor before his historic electoral defeat. Polling shows that importing more immigrants would erode the Republican Party and nullify the electoral power of Republican voters watching the debate at home. Despite the resounding opposition of the Republican voters to the Rubio-Schumer immigration plan, Rubio introduced a new bill earlier this year that would similarly expand immigration and allow corporations to flood the labor market with cheap labor. Rubio’s I-Squared bill would triple the number of wage-depressing H-1B workers admitted into the country. In Rubio’s home state of Florida, corporations like Disney have used H-1B visas to axe American workers and replace them with untrained, lower-wage foreign laborers. The I-Squared bill is central to Rubio’s campaign platform of creating “A New American Economy” with fewer workers of Western descent — the implicit suggestion being that America’s economy will be more efficient and globally integrated if America’s population more closely resembled that of the global population. This bill has been endorsed and lobbied for by Disney’s CEO Bob Iger, Mark Zuckerberg, and Oracle CEO Larry Ellison, who is one of Marco Rubio’s top donors. Conservative columnist Ann Coulter has been a critic of Rubio and other Republicans looking to surrender on the issue of illegal immigration. “Trump is leading on the seminal issue of our time [immigration] while the rest of the field practices looking optimistic in front of the mirror,” Coulter wrote in a recent column. Indeed, Donald Trump continued to connect with voters on his message of deporting illegal aliens and putting an end to a misinterpretation of the 14th amendment that allows the children of illegal immigrant parents to win U.S. citizenship. At the time of publication, Trump had received over 60% of the vote in Time‘s post-debate poll and 55% in the Drudge Report poll. Yet, perhaps in a sign of how far removed the people who make a comfortable living as professional Republicans are from the party’s voter base, as soon as Rubio began speaking, the praise began pouring out in unimaginably effusive terms. 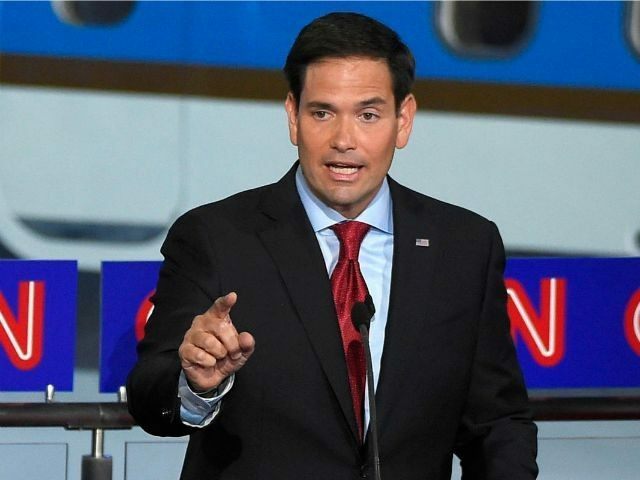 “Rubio stomps on Trump,” Weekly Standard’s John McCormack wrote. “Rubio was excellent,” wrote National Review’s Rich Lowry. “Everything he said was well-received.” Lowry had been one of the fiercest opponents of Marco Rubio’s 2013 immigration expansion plan. In a surprising admission, National Review’s Charles Cooke told readers that he finds the thought of a Trump presidency more disturbing than the definitive end of limited government conservatism and the disenfranchisement of millions of conservative Americans, whose votes will be drowned out by an influx of migrants who favor big government policies.